Finding yourself within a story is a rite of passage for any reader. There’s that magical moment when you find the analog to a piece of your own soul within the pages of a book. You find yourself with an expanding sense of empathy for characters whose feelings, memories, and experiences are familiar to your own. For fans of science fiction and fantasy, that analog can come in a variety of forms, some human, and some decidedly not. Nnedi Okorafor’s Binti series of novellas is about a young woman with deep ties to her homeland who ventures out into the stars to attend a prestigious university on another planet. Along the way, she becomes embroiled in an interplanetary dispute between the majority population on Earth and a species of jellyfish-like creatures called the Meduse. An outsider for leaving her people, who are outsiders themselves, Binti uses her skills as a harmonizer and a strange artifact to survive a Meduse attack on her living transport ship. The latest novella Binti: Home has Binti returning to her family and homeland where she encounters a mysterious figure in the night and grapples with how different she has become. Binti’s journey is one of change and self-discovery. The author of numerous novels, short stories, and articles, Nnedi Okorafor has won the Hugo, Nebula, World Fantasy Award, Wole Soyinka Prize for Literature in Africa, the Macmillan Prize, and numerous other awards and accolades. 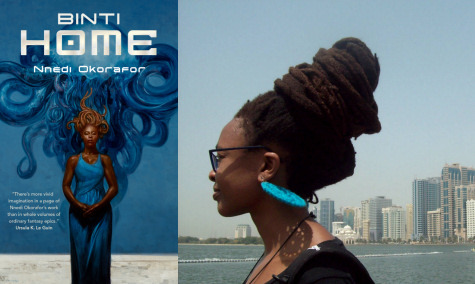 Her latest novella Binti: Home was published by Tor this January. What does science fiction mean to you? To me as a writer, science fiction has been part of my creative eye. I wasn’t inspired to write science fiction by other science fiction narratives, I started writing it because of trips to Nigeria. I would see glimpses of the future when I’d go there and the future I was seeing there was different from what I was seeing in Western science fiction narratives. I’d see people interacting with technology in unique ways. I’d see technology existing comfortably with specific traditional ways, not in conflict with it. It got me imagining and wanting to see things. I wanted to see what Nigeria would look like in the future and realized that I couldn’t name one satisfactory vision of it that I’d read or seen in a movie (note: I’m not saying I had read every rendering of a future Africa prior, I’m saying that from what I read, nothing satisfied me). And then I started looking beyond Nigeria, West Africa, Central Africa, East Africa, South Africa, North Africa . . . Africa as a whole. Then I realized how MUCH there was to write about, to see, to speculate about. And I started writing. As a reader/viewer, science fiction feeds something in me. Even as a kid, I was obsessed with nature. I spent much of my time traipsing around the empty lot across the street, looking closely at the earth and being fascinated with and researching everybody I’d find (to me, humans are only one of earth’s people). I’d wonder about things like the thoughts of grasshoppers and if ants built time machines we just couldn’t see or understand. I was also obsessed with the mystery of the planets (especially Jupiter, I was and still am obsessed with Jupiter), exploding stars, wispy looking nebulas, and the fact that in a lot of ways, because we haven’t literally touched these places yet, it’s all speculation. I didn’t read a lot of science fiction because I couldn’t relate to the points of views and concerns in them, but I read a lot of science books (my first introduction to Asimov was not through his fiction, but through his science books which I obsessively read). As I got older, technology and its potentials began to also fascinate me. Combine all this with my intense imagination, and you can see why as I got older and discovered science fiction I could better relate to, it became special to me. “Afrofuturist 419” appeared in the November 2016 Issue of Clarkesworld and featured a recorded log entry of a Nigerian astronaut stranded in space. What made you decide to include audio along with the story? Also, how did Lagos, Nigeria traffic almost derail the recording? It started as an audio story. That was my initial vision of it. A log entry by a Nigerian left behind at a space station. The story was inspired by a 419-scam letter sent to a media source that went viral. It was a scam letter that was more creative than most. The whole money-getting scheme centered around a supposed Nigerian left in space. The minute I read it, after I stopped snickering, I knew I had to write about it and I knew I wanted to write about the Naija man in space because he’d be pissed and a little crazy. The project was originally meant to be published through the BBC. I wrote the script. Then a sound engineer from the BBC named Robin Warren created the sounds . . . from scratch. The sound effects he used were not digital, they were actual sounds. He went old-school. I can’t remember the things he used, but I think sponges and, of course, water were some of them. The effects are so visceral and clear that sometimes listening to them makes me nauseous. You can practically feel the wet slapping mucousy alien tentacles in the end of the story. In the meantime, Nollywood directors and actors had to schedule time at BBC studios in Nigeria to do the recording. He only had a window of time and he nearly missed it because of Lagos traffic. But he made it and was able to work with Robin who was in London. So, this project was created in three countries on three continents- Nigeria, England, and the United States. Unfortunately, the project somehow got buried in the shuffle, so we had this awesome recorded story and nowhere to post it. So, I took it to Clarkesworld and they were happy to publish it. And this was when I added the text aspect (which I’d wanted to do all along). It was a lot of work for such a short piece, but I love how it all turned out. So much of sci-fi tech is built on cold steel, nano-tubes, and lasers, but the technology in the Binti novellas is refreshingly organic and alive. What inspired living spaceships and 1000 mph transports that slide on oil from pitcher plants? Nature is the greatest artist and scientist. If we human beings, with our rather brilliant, often flawed, sometimes evil, creativity joined forces with our creator (nature), as opposed to trying to control it and treat it like our slave, imagine the wonders we could create. If we worked with nature, we’d also avoid being the target of nature’s epic wrath. This is why when I write about technology, I naturally (pun intended) go in the direction things are already going, i.e. organic. Pieces of ancient tech whose purpose has long been forgotten are called edan in Binti's universe. Do you own an item that you hope in 1000 years people will call an edan? Not surprisingly, the object I choose is organic and not created by humans. 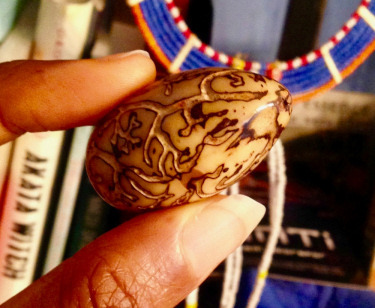 So, I have this seed thing that I bought from a gruff, irritable man selling trinkets (crystals, strange old rings, gemstones, and other objects) on the side of the road in Nigeria over a decade ago. It’s large and smooth, except for these intricate patterned grooves. That thing has appeared in various forms (usually as an alien seed) in three novels I’ve written now. I like to see it as a piece of alien technology that is yet to be activated. It’s sturdy enough for me to see it surviving a thousand years. And I can see it sprouting one day and something strange growing from it. Mathematics is more of a magical force in Binti rather than a logical science. What inspired this? The fact that I’ve always seen mathematics as magical. Growing up, my favorite and best classes were in the sciences and math. For me, I was best at math when I relaxed and came at it sideways. I could solve difficult math problems and mentally visualize equations when I didn’t focus too hard on them. If I did, it would all fall apart. Also, in the natural world, mathematical shapes are where patterns come from. Everything in nature is mathematical, really. And it’s so pervasive, yet amazing that it’s magical, at least to me. Binti's journey takes her farther and farther away from her home and people both physically and figuratively. What is the importance of someone who has become an outsider looking back in? See, that idea of leaving and then where you’ve left becoming “back,” “behind” is the issue to me. I think you take every experience into you and that’s what makes you, you. I think the past, present, and the future coexist within us all the time. I think we carry more than we want to accept. I think to be “weighed down” is a beautiful thing and can lead to a sort of enlightenment. That said, it can also be disturbing and heavy and tiring and isolating. You see a lot more, from more sides, with more depth, more weight. And in returning, you bring things that can affect and change “home.” Change is life, stagnation is death. In Binti, you introduced readers to the Meduse, a species of jellyfish-like creatures. I became fond of one Meduse in particular. Okwu has become one of my favorite characters and is a deceptively complex being. What are some of the challenges of creating relatable characters without familiar physical human reference points such as eyes or a mouth? I based Okwu on someone I know who’s way of thinking and behavior is just . 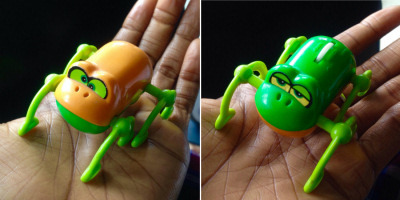 . . alien to me. I’m laughing now, but this is true. So because Okwu is based on someone I know, it’s easy to tap into it. And I spent a lot of time trying to understand the person Okwu is based on and in trying to understand, I had to really step out of myself. And what I also learned was that though I eventually did understand and grow fond of this person, it was still ok to totally disagree with his truth. We didn’t have to hate each other; we could be friends. That was a big big lesson for me. As far as the physical differences, I’ve just finished the third book in the Binti series and it’s still weird. But it’s not just with Okwu. I encountered this weirdness throughout the story. The biggest example was when I wrote the Oomza Uni launch port in book 2. This is a launch port for people from all over the galaxy. How big should the entrance be? What kind of atmosphere should the various launch port areas have? Language? Sound? Would some of the people view other people as prey? Some people aren’t even to be seen with the human eye! What a headache I gave myself. How has your time as a professor influenced the creation of Oomza University? My time as both a student and professor greatly influenced the way I imagined Oomza Uni. It’s an entire planet that is a university; universities are like another planet. University departments have always been like cities to me and that’s what they are at Oomza Uni. What I love about universities is that they are full of super smart people who are so obsessed with such specific things. Extraterrestrials, indeed. And the idea that barely anything is strange at Oomza Uni because most likely someone has research the hell out of it; familiar territory to me. Binti was your first story set in space? What made you shrug off the earthly shackles and send your characters out into the stars? A plethora of things led to me writing a story in mostly set in space. When I wrote Binti, I had just left my own family back in Chicago to take a position at the University at Buffalo. My family didn’t want me to take the position at all. I was in a really unstable mindset at the time. I’ve always been terrified of space (because without super amazing equipment, humans die in space) and I tend to write out my fear and pain. And I have always loved Star Wars, which takes place in space and on many worlds. In order to get to other worlds, one must travel through space. The combination of all these things led me to write my first story in space. How did your travels to South America and the Middle East influence the Binti novellas? There is a story behind the 2013 trip that I took with my daughter from Brasilia, Brazil, to Atlanta, USA to Sharjah, United Arab Emirates in two weeks (all for writing festivals). There isn’t space here to tell it. But I will say that that trip evolved both my daughter and I in fundamental ways. Those changes partially led to the writing of Binti, as well. Seeing Dubai and Sharjah was epic. I have never seen such a complete and glorious clash of the ancient, new, and the idiosyncratic. I felt so foreign there, but at the same time completely at home. Also, when I looked into the Kalifah Lagoon in Sharjah, I saw my first wild and living jellyfish. It was blue and swimming like it owned the place. This moment was the inspiration of the Meduse. Does the next novella have a title yet? Can you give us a little teaser as to what happens to Binti? Right now, it’s called The Night Masquerade and I’m not sure if it’ll be considered a novella because of its longer length (but I’m not worried about this at all). It completes the trilogy with a bang (though I suspect there will be more in this universe). What other projects do you have in the works? Do you have plans to experiment more with audio? Akata Warrior, the sequel to Akata Witch (my YA fantasy novel set in present-day Nigeria) is scheduled for release this fall, finally. I’ve been working on it for nearly six years. I’ve got a comic book project that should soon be unveiled, a short story for a really cool project called The Years Without Winter, and film projects quietly bubbling beneath the surface. And I’m deep in the edits of my next standalone novel titled Remote Control, which I’ve also been working on for many years. I’d love to do more audio experiments. The stories decide format, so I have to wait and see.